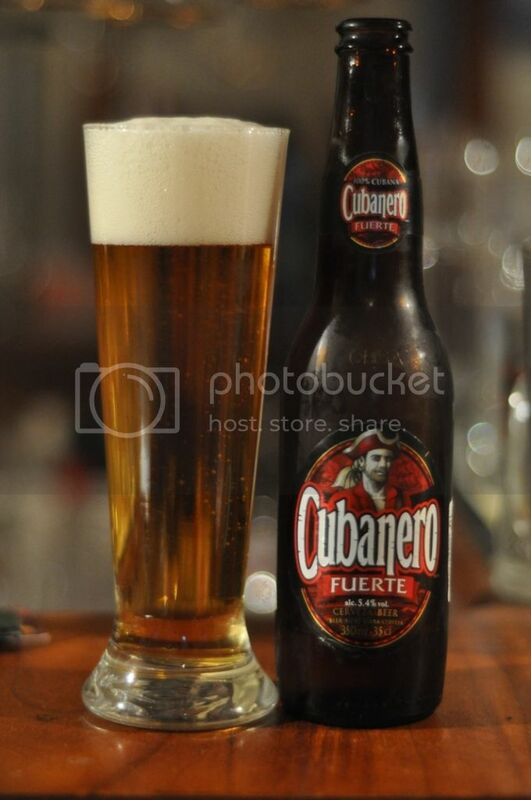 Cubanero Fuerte is the second Cuban lager that I've ever had. This one has been sitting in the fridge for a while and tonight I just felt like a simple tropical lager. Here's hoping that this beer fills that role! I've heard that in Cuba you can buy a bottle of beer at the shops for the same amount as in a pub/club, which I think is pretty unusual. If this beer is similar to the other Cuban beer I've had, Palma Cristal, I'll be pretty happy it's exactly what I'm looking for. Normally I don't talk about the label art-work but I really like this stylized pirate logo, the label is more detailed than you can see in the picture. Anyway picture aside the beer is still quite impressive. It's a dark golden colour, a bit darker than most lagers actually, with a thick 4 finger offwhite head. The head has some retention but does eventually all fade away leaving almost no trace of lace. Still a nice looking lager though. Cubanero has a very mild smell with an unusually strong metallic aroma considering the lightness of the overall aroma (does that make sense?). There is a light smell of grains and the hops are close enough to non-existent. The metallic smell is actually not unpleasant, but it is quite different and may alienate some drinkers. For me this lager doesn't smell too bad. Like the nose of this beer the flavour is quite mild. It tastes like a standard macro lager with a corny hint of malts before some bitterness takes over. The beer still ends up as mildly sweet but the hops, which have a slightly metallic tinge, provide enough bite and the carbonation gives the tongue a nice tingling sensation. You would be able to drink so many of these on a beach in Cuba, it would make such a good session beer! If I had to make a decision between Cubanero Fuerte and Palma Cristal, I would probably choose this beer. Both have their positive sides but I think the extra ABV and drinkability would give Cubanero the edge. It's a nice enough lager but it probably hasn't done enough to earn a regular spot in my fridge though. Worth a try if you're interested in unusual foreign lagers.